TENS Units is a personal system, designed to stimulate nerve muscles and treat, manage or postpone joint and muscles pain. It’s an advanced machine used for a non-invasive, drug-free electrotherapy. Earlier, TENS Units could have been bought only through medical prescriptions. But, now the same is available online at several websites. Painkillers are not the only treatment available for getting rid of chronic pain. It may give you instant relief, but for a longer run, you will have to search for drug-free options. Be it long working hours or changing lifestyle; chronic pain has become a common ailment affecting a large number of population. The worst part of the pain is it drags you down and makes it impossible to either work or enjoy with family. The pain may arise out of any physical conditions like arthritis, sprain or injury. If we take account of all the drug-free, natural ways to treat pain, there are plenty of them. However, as they don’t give instant effect, they are not so popular. Still, if you are looking for a permanent solution for your pain, you should try some of this offbeat & natural ways of pain management. In this blog, we are giving you complete information about TENS Units like their use, risk, benefits, etc. Before heading out to buy it at any portal, have a look at the key information. A Transcutaneous Electrical Nerve Stimulation (TENS) is a therapy. It is performed by using low-voltage electrical current for pain relief. This therapy is performed using a device is called TENS Units. TENS Units is a smart non-invasive electrotherapy device. It’s a drug-free way to treat, manage or break the cycle of pain. It’s a small machine operated by battery and works to transmit electrical pulses to the body. TENS devices have been considered an effective drug-free treatment for pain. TENS devices use electrotherapy to treat the effective area where painless electrical impulses are targeted to the nerves. Normally the operation of TENS devices is very easy and safe to use, for example, TENS 3000 has been designed with Safety Amplitude Cap to increase user safety. The cap protects the amplitude and helps to prevent any accidental bumps. How Do TENS Units Perform? When you use TENS Units, it gets connected to your body by electrodes through small self-adhesive pads. These small pads enable you to direct the electrical impulses straightly to the affected. TENS Units is used to relieve pain for different types of illnesses and conditions. TENS units are typically good for the problems related to joint, muscle. They are used to cure or reduce the conditions of low back pain, long-lasting (chronic) pain tendinitis, labor pain, neck pain, arthritis problems or sudden acute pain, etc. Two popular TENS units are TENS 3000 Units and TENS 7000 Units. 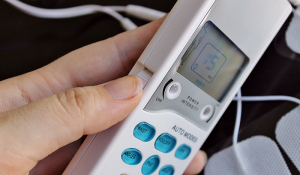 Tens 3000 Unit- TENS 3000 unit is designed to allow non-invasive, drug-free electrotherapy. It is a perfect tool for those suffering from joint and muscle pain. This machine is designed with a transparent pivoting cap. The role of the cap is to cover the amplitude knobs and allow better user safety. Some of the key features of TENS 3000 unit include dual channels, three modes (Burst, Modulation, Constant), Safety Amplitude Cap, microprocessor technology for precision dial performance. When you buy The TENS 3000 unit, it normally includes Lead Wires, 1 package of high-quality Self-Adhesive Electrodes, Stimulator, Instruction Booklet 9V Battery, Hard Plastic Carrying Case. Tens 7000 Unit- The Tens 7000 unit is another pain management system, it’s powerful but gentle. It is good for managing, reducing or breaking the cycle of back pain, lower back pain, shoulder ache, neck ache and acute or chronic pain, etc. Like TENS 3000 unit, Tens 7000 Unit also comes with 5 modes. They are a patient compliance meter, timer, a stronger 100mA output, amplitude cap, firm metal belt clip. It’s a dual channel digital device, having adjustable pulse amplitude, pulse rates, and pulse width. When you buy the unit, it includes 4 pre-gelled electrodes, hard protective carrying case, 9-volt battery, and lead wires. The most crucial question popping your mind may be ‘Is TENS Safe?’ According to medical experts, TENS is a safe and risk-free way of dealing with your pain. Though, the machine can put you in some problems if not used properly or they are misused. It’s good to consult a physiotherapist or your health practitioner before using the TENS units machine. They will explain you the proper way of using it. Also, tell them if you are using another therapy or want to use an alternative therapy machine to control your pain. To conclude, TENS therapy with the right use of a machine is really safe to use. It can be better than the traditional way of reducing or managing pain. Resveratrol is a natural substance that works on a cellular level for pain relief. It is found in red wine, grapes, and berries and is loaded with many beneficial properties like anti-cancer, brain protection, and even life-prolonging benefits. Meditation has been found very helpful in managing the pain. If you are a newbie, you can start concentrating on any pleasing sound or soft music. With regular practice, you will improve. Try to control your thoughts during meditation. Start with a few minutes, gradually increasing the duration. Try to keep your posture comfortable during meditation, you don’t always need to sit up starting with your legs crossed, you can meditate even while sitting on a recliner with heating pads or even in a warm bathtub. Sleep is one of the most effective pain management. Taking sufficient amount of sound sleep is important. Doing exercise and physically exhausting the body will help you take a deep sleep. Meditation, yoga and other psychological techniques can also aid to sound sleep. What works for one patient do not apply for other. So, it might be possible that you find one of these ways more effective than others. How to Negotiate With Creditors?